Do I have any sympathy for Mark Carney? No, of course not, he’s a technocrat pretending he has many strings to his fully independent bow, whereas in reality the bow itself does not exist. ‘Mark Carney warned that policymakers would have limited space to stimulate the economy after a Brexit vote because a sharp slowdown in growth could be accompanied by a spike in inflation. 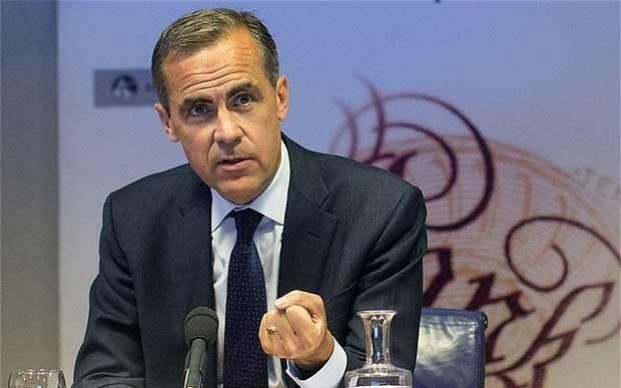 Mr Carney also said that mortgage costs for homeowners could rise even if the Bank cut rates to boost demand. A Brexit could push up the perceived riskiness of lending to households “for a period of time”, he said, which could force banks to rein-in lending and pass on higher costs to customers. Summary: he didn’t have a clue what might happen if the vote was to leave. Not a mention of gilts and their yields, how odd. Currently gilt yields are at record lows, a great time for holders of these ultra-safe investments. (As long as one ignores sterling’s trajectory of course). Sadly, overseas investors are looking at sterling, and indeed are pulling funds from the UK already, and Brexit will be used as a convenient scapegoat of course. The UK’s problems run so deep that in or out of the EU, this little island will sink under its debts before too long. You think a sterling slide will help exporters? Where do most of the raw materials come from ? What about the imports? The UK trade deficit is dire, and will not recover in my lifetime. Carney said a first wave of contingency measures drawn up by the Bank and Britain’s finance ministry were “working well”. He also said the Bank had “a host of other measures and policies” to steer the economy and Britain’s vast banking sector through the shock triggered by the referendum result. Other central banks hold a clue to the options open to the British central Bank. The BoE, which purchased small quantities of corporate bonds when it first started its quantitative easing program in 2009, could follow in the footsteps of the European Central Bank by buying them on a larger scale. The BoE could also take further credit-easing steps to reduce the cost of bank loans to help spur investment. The Bank will hold weekly sterling liquidity auctions between now and the end of September – instead of monthly – as a precaution in case banks run into problems getting hold of cash. So, more stimulus, conveniently timed to coincide with the first signs of capital flight from the UK. More electronic units of sterling created from thin air and used to buy up more debt. I am sure the world’s largest investors will react enthusiastically to the prospect of a (barely concealed) admission of the UK government and central bank that its national wealth can be ‘stimulated’ merely be printing new money. How easy it is to be a technocrat, even if all a quiver. The puppet of Her Majesty’s Government, themselves the puppets of the masses. Think about it. No arrows, no bow, so he’ll fight bare knuckle, versus the global capital markets. Good luck to him. It’s time to delve into the murky waters of the nexus between money, central banks, governments, banks, and humankind. Most of my thoughts are focussed on the present and the future, rather than the past, so that means there will be a certain amount of informed speculation. It’s much more interesting to look forward and consider where we are going (using current/recent events as a guide) rather than be constantly looking backwards for a guide to the future. Everything is subject to change at all times, so it’s best not to have a fixed view, but to treat matters on the balance of probabilities having considered all available evidence. So, some readers may need to cast aside any existing biases and prejudices they may have around this rather meaty subject, as the future is likely to make those biases irrelevant. Where to begin? I’ll start by stating that I have seen plenty of evidence that money is and always has been debt, and that it simply evolved that way. The best anthropological evidence of this evolution is contained in the early sections of David Graeber’s book ‘Debt: the First 5,000 Years’. (NB, I’ve not read the whole book, as Graeber’s solutions apparently do not differ much from those of Krugman, Piketty et al, and so are similarly interventionist, and hence flawed). The barter economy is a myth. Mankind has always needed to account for its debts, whether to our rulers, to religions, to fellow producers, whatever the reason, we’ve needed a way to account for our debts. So various arbitrary items have served as money through the ages, some with intrinsic value, and some without. Knives, whales teeth, bracelets, horses, paper, gold, and even little electronic bits of data on a server: all have served as money at some time. Ultimately, all forms of money have always just been a record of what someone owes someone else. There’s nothing at all wrong with that in my opinion, it’s a natural method of dealing with the transactions that have always happened since man became civilised. It’s worth noting that these debts generally come with some interest charge to reflect the importance of time and risk of non-payment to the creditor, and again, I am supportive of interest charges to reflect the risk to the lender of non-repayment of his loan. As far as I am aware, for many centuries (certainly back into the 1600s), money has been issued by the sovereign state (with just one recent exception). Whether that sovereign was a democracy, an empire, a monarchy or a totalitarian dictatorship, the sovereign has issued by decree the official money for its citizens. Of course, the sovereign gets a big advantage from this state of affairs, most obviously from the effects of seigniorage. As central banks issue the notes and coins (and some of the electronic money too) we see the first example of the great monetary nexus. All of the central bank’s seigniorage profits flow back to the government in control of the sovereign state (with just one recent exception). Apart from seigniorage, central banks and governments have always been tied at the hip for as long as central banks have existed (with one recent exception). Central banks were formed by Kings or governments to raise funds for wars and other items (such as to pay for line dancing parties for its employees). Central banks have continued to act as fund-raisers for sovereigns ever since. But sometimes it’s been a two-way street, and the central bank itself has needed a government bailout, or has simply been abolished, along with the currency itself, lost to history, as both the currency and the government itself collapse. It’s not really been a particularly strong track record for this pair within the nexus. ‘Giving evidence to the Treasury Select Committee on financial stability, Mr Carney was asked his view on The Daily Telegraph’s interview with Jaime Caruana in which the head of BIS warned that the world economy is just as vulnerable now to financial crisis as it was in 2007. Mr Caruana had warned that investors were ignoring the risks of monetary tightening. In its annual report last month, BIS said the policy of “forward guidance”, adopted by the Bank of England and America’s Fed, was encouraging investors to take on more risk. It’s worth noting that the 2% CPI target also existed in the UK for the previous 5 years, have a look at the chart below, and I’ll let you draw your own conclusions on Mr Carney’s ‘independence’ , as well as his integrity. I view the Federal Reserve as being the poodle of the US government, the Bank of England as being the poodle of the UK government, and the same with every other central bank in the world (with one group as the recent exception). The central banks have more recently taken to creating money from thin air to buy their own government’s debts, effectively printing money to fund the government when times are tough, a sign of desperation (on the part of the sovereigns) to be sure, in most instances. However, they seem unable to stop deflationary forces from spreading, so we will soon inhabit a world that recognises that monetarism is a myth, it simply doesn’t work (we’ll cover that in another post), and all that a central bank needs to do (and can deliver) is to maintain price stability. So, we have to accept that central banks and their sovereign masters are happy to allow persistent inflation, and this is a relatively recent phenomenon, arriving early in the 20th century. Before that inflation and deflation came and went, and neither were predominant, as this very long term chart shows, generally prices were very steady over a very long period of time. But look at how it all changed early in the 20th century, as the world moved away from settling its national debts and allowing them to grow without limit. How can we NOT have had some deflation in the past 40 years? We’ve had globalisation, huge technological advances, and sliding demographics. It’s the sovereign/central bank nexus deliberately causing it, for their own benefit. Of course, the world had been through hell for many years early in the last century, culminating in World War I. For some reason, at that moment in time, during the (forgotten) depression of the early 1920s, the great(?) nations of the world decided that they’d had enough of economic reality (living within their means) and they decided at a conference in Genoa in 1922 to change ‘the rules of the game’. For the first time, debts would not be settled (in gold) internationally, instead they could be settled (but not really) in paper gold promises-to-settle. I will probably look at why this change took place in another post, but my research to date indicates that the advent of democracy and socialism was a major influence, as well as American policy, designed to halt their depression and re-inflate the Europeans. The result was an immediate and massive inflation, engendered by the central banks via the banking system, applauded by the governments, and remembered these days as the Roaring 20s. This image below is a section of a research paper by the Fed which explains how it all got a tad out of control within the central banking world, with reserves increasing by tenfold in this period, something like these past 7 years. Some of you may consider inflation to be a rise in prices of the things and services that we use and buy, but actually monetary inflation can (and does) often appear in financial markets first, as we saw during the 1920s. We all know how these things end however (even though most participants in the markets have no clue at the time). As I often repeat, certainly since the early 1920s, there is nothing much new in the world of money (with one notable recent exception). So, to date (with one recent group as an exception), central banks have existed to help sovereigns meet the growing needs of the population, and make a bit of money to help said sovereign along the way. Is there anything inherently wrong with this set up? The only thing wrong with it is that continually (always) the people using the money take a hit (to varying degrees) as confidence erodes in the money being issued, and in the sovereign itself, and inflation gradually eats away at people’s real income levels and the value of their savings. (Also, eventually, it all collapses in a big heap, after serial bubble-blowing experiences, presenting its major flaw). However, it is fair to say that the population themselves would tend to be supportive of this nexus; certainly the majority would be, as they are in many ways reliant on the sovereign for their standard of living, especially in the past 100 years or so. Yes, your whole life has been lived within a debt bubble, did you know that? Well, it’s going to burst within the next 20 years, so do try to enjoy it while it lasts. The desire these days is for government to take care of everything for us, from healthcare to education to pensions. I see plenty of evidence today, and through the past 60+ years that government does a pretty poor job of managing anything it attempts to manage, and of course when it comes to managing a sovereign economy made up of millions of individuals, each of them acting in isolation, within a global market place of many billions, and subject to the influences of nature, I roll my eyes at the futility of modern economic thinking and sovereign planning. The longer-term (evolutionary) direction is away from this state of affairs though, and the breaking of the nexus is a strong move in that direction. You may agree that the end result for a government’s money is always likely to be the same, simply because the government is incompetent and biased in seeking to devalue its money and live beyond its means, and mankind and its economic interactions can’t be planned and controlled. Of course, you could rightly argue that many governments are simply a reflection of its voters, but that’s just evidence that pure democracy is likely to lead to poor outcomes, given humankind’s foibles and the desire of the less able to improve their lot at the expense of others, whilst always ignorant of the need to earn one’s standard of living via wealth creation. It’s ironic that democracy means that voters ultimately control what their governments provide, and if you’re accustomed to (or keen to escape from) abject poverty you are likely to vote for plenty of free stuff from the sovereign gravy train, whether that is at the expense of taxing those with more resources, or whether it means a continual increase in the national debt and ongoing inflation (at the expense of those with wealth). Most voters don’t really care about the debt, as long as they’re OK, and most voters don’t realise that their government is keen to see some inflation to maintain an appearance that all is well with the world, and of course to depreciate the real value of its own debts. Certainly, most voters never think about the longer-term implications of the debts accruing. The whole set-up is clearly flawed, and one day, in the not-too-distant future, we will see the final brutal denouement of these eternal inflations, a final day of reckoning. It will be shocking to behold, despite being inevitable since the 1920s, due to the laws of mathematics and market forces. Until then (and maybe even afterwards) my fellow humans are unlikely to see where the problem lies, and therefore won’t see the solution as it unfolds before their eyes (even though it is helpfully described step-by-step by the architects of the evolution for all to see). Public opinion will continue to be informed by the left-leaning media, and of course by sovereigns themselves, especially as governments are pushed further and further into socialist policies by their voters. So, if only there were a way of taking the central bank money creation power away from government and its people, or better still, if they decided to give up the money creation power voluntarily to a detached supra-sovereign system of some kind. Could that work? Keep reading. (If you’re thinking ‘But banks create most of our money via loans, yes, I know, and I’m coming on to this point next). Let’s look at banks now, and where they fit into the nexus. Banks. You know, in the current monetary set-up, don’t you just hate banks? They make billions in profits when everything is on the way up, but when it all comes down they seem to be rescued by the taxpayer-funded sovereign. They break all sorts of laws (money-laundering and rigging markets for example), and they appear to do just about anything and everything in their quest for short-term profits. Yet, apart from relatively measly fines, and the odd individual criminal case, they seem to just get away with it. How do they do this? Well, it seems that their influence is clear, in that they spend a lot of money on politicians (both via donations and post-politics career opportunities). Yes, the lawmakers like to help the banks. This is human nature of course, those seeking power (and its attached benefits) need money, to pay for campaigns and other incidentals. Banks can supply plenty of money. Those in power also need money to keep the government running, and the system (currently) relies on banks to buy huge amounts of all that government debt being issued. It’s mutually beneficial to all concerned in the current system. It also works the other way of course, as many ex-bankers end up in government, pulling strings to help their former colleagues. This part of the nexus is clearly rigged heavily in the banks’ favour, but make no mistake that the sovereign is a clear beneficiary also, and given that the sovereign is following the path set by voters in democracies, then the citizens also benefit from this system, as it enables expansion of credit to households, and also enables expansion of government benefits and services via the funding of governments through bond issuance. ‘Zoltan Pozsar — who will be at Camp Alphaville, so buy your ticket now! — has a fascinating new slide deck illustrating the changing landscape of US household debt, which, thankfully, is easier to read than his incredibly detailed map of the shadow banking system. ‘In terms of ownership, about a quarter ($3 trillion) of the total stock of debt owed by American households is held either directly by the government or central bank. (This slightly understates the role of government as creditor to the household sector since the $1 trillion “other” category includes mortgages retained by Fannie and Freddie, as well as consumer loans and mortgages made by credit unions). What’s changed since the crisis? For starters, the government has become much more important because it is the only sector meaningfully boosting credit provision to American households. The Fed bought about $1.7 trillion worth of agency MBS, while the Department of Education started making (and retaining) student loans in size. By contrast, “shadow” lending has contracted by about a third (from $3 trillion to $2 trillion) while domestic “real money” holdings of household debt have collapsed by about half (from roughly $4 trillion to $2 trillion). Traditional bank loans retained on the balance sheet are up since the crisis, but not by much. Join me in cringing at the conclusion that government taking over the role of lender of last resort to the population is ‘good for financial stability’. Another statist writer, they’re everywhere these days. Once again, it’s a significant portion of the other member of this nexus that gets hit as banks are bailed out: the poor old taxpayer, as his taxes rise, and his currency takes a hit (to varying degrees). Anyone with savings, pensions, or an earned income suffers, whilst those relying on the sovereign for work or welfare are protected to a large degree. Some blame capitalism for this state of affairs. I prefer to be clear: the current set up is very far removed from a free, fair and open market, and whilst capitalism does not mean the same as ‘free, fair and open markets’, big banks are giving capitalism a bad name. If there is a benefit from the nexus as described so far, it has been to enable a huge artificial increase in the standard of living of the developed world (and to a certain extent the whole world) as the temporary effects of hundreds of trillions of unconstrained debt spending feed through to the masses. It’s very liberating to realise that virtually everyone alive today has lived within a freakishly massive bubble that started in 1922. But hardly anyone realises it. They will realise it eventually as the final reckoning lies ahead, maybe as the next economic downturn unfolds, or maybe at some point further down the line. If only, we wish, there was some way to break the nexus between banks and sovereigns, so that bailouts were not available, so that banks were more careful in buying government debt (because it’s not risk-free you know). If only the normal rules of the market were applied to banks (if you mess up: tough luck, bye bye). If only mankind was clever enough to devise some way to solve these problems. Jumping back to money itself, and its place in the nexus. What do we really want from money? In this instance, for the sake of clarity, I am going to refer to a cardboard box of paper notes carefully hidden under one’s bed. Real physical paper money. Speaking for myself, I want to be able to spend that money whenever I choose in my home country (plus other countries if possible, that would be a bonus), so it needs to facilitate the exchange of goods and services. Ideally, it would be handy if it were available in nice round amounts, so that I could add it all up easily and without needing a calculator. And ideally, I’d want to know that it would hold its value over time, especially over what I would term the ‘short/medium term’ of up to 5 years. That isn’t a long list of requirements for money to work for me, and it’s not really an especially demanding list of requirements. Is it? I can read your mind, you’re thinking ‘but money never holds its value’ or ‘there’s always inflation and there always will be’. These are understandable thoughts, as they are based on your experience of money to date, and the experience of nearly everyone that has ever used money on our planet. (Although we have experienced long periods in the past where money not only held its value, it actually gained in value in real terms due to the impact of deflation on prices). So far, sadly, in the current system established in 1922, money has failed to perform one of its basic tasks: to maintain its value. In many cases of course, money has done the precise opposite, and has lost all of its value, via a collapse in confidence in the issuer of the money. Bear in mind that all issuers to date have been sovereign states (and their central banks) with their own money (with one recent group as an exception). So, ultimately, the collapse of money’s value is a collapse in confidence in the sovereign itself. Maybe because the sovereign has overspent, and kept overspending past any sort of reasonable limits, because they had the means to do so, thanks to the generous central bank over the road, and the banks that grease it all along the way. It doesn’t matter what sort of money we’ve tried in the past or right now (with one recent exception), the sovereign has always found a way to ruin it eventually. Human nature? A poor system? Natural cycles? Inevitability? Yes to all of these I think. So, the pessimists amongst you will already have concluded that this is the way of the monetary world, we are doomed to repeat history over and over again, and the only way to escape the madness is to embrace it as inevitable and find some way to hedge against the effects of the nexus. This is not the case. The passage of time will reveal much, perhaps even to those with their minds made up already, but something radically different is being attempted, right now. The final link in the nexus of money is of course the citizens who use it daily to run their own affairs, people who earn it, people who borrow it, people who save it (via banks or into various investment assets), and people who generally rely on money for one reason or another to safeguard their financial welfare now and in the future. Since the end of the second world war, the developed world has moved further and further into debt in order to provide many of the welfare benefits that its citizens now take for granted. The population is so accustomed to the largesse of this sovereign gravy train that they cannot conceive of it shrinking. Some of them may believe that welfare for the indolent should be reduced, but tell them that their state pensions will be similarly cut and you’ll lose their vote at the next election. As demographic trends mean that ageing voters already outnumber the younger generation, it would seem a safe bet that voters will not be voting for reductions in government budgets any time soon. So, within the nexus, voters are driving government budgets further and further into the red. Even in countries where voting is not required, or is a sham, sovereigns are still driven along the same road by the knowledge that their population is accustomed to a certain lifestyle, and so it needs to be maintained, or revolutionary thoughts may arise. Politicians don’t need elections to realise this obvious fact. Voters are ignorant of the central bank-sovereign nexus as described in this post, and also oblivious to the fact that as recently as the 1970s many major currencies and sovereigns were in deep monetary trouble, with inflation/confidence issues running out of control. No voters (or politicians or central bankers) see that being repeated in the future, they are confident in their sovereign state and the money they use every day, even as they see their real incomes dwindle in recent years. The average man or woman doesn’t understand what causes inflation, or the influence of these nexus connections in ensuring it is guaranteed (and even targetted) in the current system. I’m not really sure what the uninformed person thinks about banks these days if I’m honest. Maybe they distrust them, maybe dislike the taxpayer-funded bailouts they received, and begrudge the huge salaries and bonuses they imagine the bankers receive? But the levels of debt held at household level in most of the developed world indicate that the people are quite happy to borrow from banks to fund consumption, as well as for investment and home purchase. So, a necessary evil; that might be the view of the man on the street? Would the citizens of the developed world have been happy to see many major banks go bust in the credit crunch crisis? I think that would depend on how each of them was affected personally. If they didn’t lose any money themselves, I think most people would have been happy to see a few banks go under. But those people were probably ignorant of how much the banks support their sovereign’s own borrowing requirements, and therefore how they would have been affected by bank failures. My conclusion is that the developed world’s population are mostly totally ignorant about these issues, and so the other elements of the nexus can continue their insane dance for as long as it all holds together, whilst throwing the masses a narrative that at least gives the appearance that naughty bankers will be punished (with one notable recent exception). One final point before I move on to the changes that are afoot that have the potential to shatter this nexus for good (and for the better). Inflation is a deliberate feature of the nexus, pushed into the system by ever-increasing debt bubbles which are blown by the banks and sovereigns to suit their own agendas (short-term profits and larger governments) whilst being welcomed by the masses, as they love to borrow cheap money for items that would otherwise be unaffordable. There is however no reason whatsoever why inflation needs to be a permanent feature of our monetary system, once the nexus is broken, and indeed inflation and deflation were both features of sovereign money before central banks were created. If you consider the last 30-40 years, and the huge technological advancements we have seen, as well as the impact of globalisation on corporate cost structures, you may wonder how on earth we haven’t seen very regular beneficial periods of falling prices in all goods and services. Instead, we have seen deflation in some areas (such as computer technologies), and inflation in others (such as food and energy). This is accepted as ‘normal’ by most, but there is no need for it. A little bit of inflation every year may appear to be insignificant, and you may think there’s really no need for the status quo to change in that regard (as long as you yourself can find a way to hedge against it). But that attitude ignores the pernicious effect inflation has over the longer-term (10 years+), and how it forces people into the arms of the financial industry in seeking to protect their wealth and their future income (pension funds) from the effects of inflation. It also ignores the simple mathematical fact that any system built upon ever-increasing debt bubbles simply can’t and won’t be sustainable forever; it will ultimately collapse in a heap. Add to that the detrimental effects of ever-larger governments (non-productive, absorbing the wealth and incomes of its citizens, the ultimate parasite), not to mention their capacity to wage wars when it suits them, and I believe that those who support (or accept with a shrug) the post-1922 system and its continuation are intellectually very lazy. Thankfully, change is already upon us, although you may not have noticed it yet. If you follow the financial world at all, you will have seen examples of the nexus being broken, but perhaps you don’t grasp the implications, or realise that what you noticed wasn’t just a one-off, it was actually a signal of a wholesale changing of the rules, and the destruction of the nexus itself, taking us back to a world where economic reality is based upon the principles of free, fair and open markets, and their application to ALL actors within an economy, including banks, central banks, sovereigns and the people themselves. But I recognise that we’re not headed for an anarcho-capitalist system, with zero government, no welfare, and everything left to individuals to decide locally. No, we are headed for a system where voters will decide exactly what they are prepared to pay their governments to deliver, based upon taxation and a relatively modest amount of borrowing, priced at a rate of interest set by the market. Finally, a system where governments won’t be able to levy the hidden inflation tax on everyone, as there will no mechanism to do so, as the nexus connections will have been (and are in the process of being currently) severed. The changes ahead will be dramatic and painful (in the short term) for many. But a huge leap forward is being attempted, and I expect it to be successful. If you follow the world of money as closely as we do, you will not be at all surprised by the information contained in this brief post. If this is news to you, and you have more than 100,000 in any Eurozone bank, well, you may want to consider your choices in the near future. ‘Banks – allowing them to fail’. ‘So which problem am I talking about? It is usually labelled the “too big to fail” problem. It refers to banks that are so big, so interconnected or so important that their failure might bring down the entire financial system. Consequently, the government has an incentive to step in and bail out these banks in order to prevent a systemic meltdown. Banks that were deemed “too big to fail” therefore operated with implicit government support that was provided free of charge. Such support, however, can induce banks to engage in risky transactions. If things go well they take the profit, but if things go wrong the taxpayer foots the bill. Obviously, this is a less than optimal situation from any point of view but the banks’. That’s our emphasis in the paragraph above. Given the trajectory of the global economy and the trillions in lending by Eurozone banks to the developing world over the past 5 years, it is a safe assumption that the ECB’s preparations for dealing with failed banks (tidily, over a weekend) will not have been a wasted effort. The world is about to experience significant turmoil; there will be winners and losers. The policy described above is nonetheless a huge leap forward for the world, and it seems we are entering the closing stages of the monetary madness we have endured since 1922. The past nine months have been very interesting indeed. There are a large number of developments worth considering, and our view is that there is one theme connecting them all: The US dollar. Many market commentators are confused by the move, considering that it will exacerbate deflationary pressures within the Eurozone. Banks are concerned that their systems simply can’t cope with negative rates on ‘money’, and of course don’t like the idea of being charged interest on surplus reserves. Our thesis of the planned evolution of the world’s monetary system would support this view, as the current (non) system, based upon the US Dollar, has been seen as unfit for purpose since the 1970s, and preparations have been being made to move to a better system ever since. Only now do we enter the final stages of the move away from the dollar. Further evidence emerges in support of our view over the past eight months, as we see the price of crude oil slump, partly in response to the rising dollar, but in our view, due to further coordination in applying pressure to the dollar and to America itself. (It should be apparent that pressure is applied to the dollar and America by causing or allowing the dollar to rise against other currencies). The Saudis have made it quite clear that they are not frightened by low oil prices, and why should they be? Already though we are seeing that the viability of US fracking is at risk. We also see that US dollar debt funding for oil purchases is much reduced, further adding to the dollar squeeze. We also see that credit advanced around the world in dollars (mostly Eurodollars, supplied by funding outside of America) is becoming dramatically more expensive for foreign borrowers, whose own currencies are now significantly weaker against the US dollar, just as their economies are slowing down. Everywhere, tightness is evident in the dollar market, and this propels the dollar ever higher. Already US executives are bemoaning the ‘strong dollar’ and begging for some reprieve from the US Treasury or the Fed. What can the Fed do, as it strives to avoid negative rates at all costs (for therein lies the death of the dollar)? Also, we see more evidence of foreign governments moving away from supporting American government deficits. Please review the US Treasury’s TIC data for the past year or so, it is very clear that China (and other official entities) have stopped accumulating new US treasuries, and very gradually are dis-investing some of their existing holdings. We believe the timing is not a coincidence, rather all part of a well hidden plan. Finally, we see European QE launched recently, but in a different fashion to that of the other major central banks. The biggest difference is that most government bonds will be bought by their own national central banks, with no risk sharing on future potential losses. To date the ECB have not announced how the national central banks will repay any losses back to the ECB if Euros created to buy national government debt turns out to produce losses. In reality, there is only one way that repayment can be made, via traditional means. Think about it. As we approach the final stages of implementation of this 60+ year-old plan to move away from the US dollar there remains much danger, both economically and geo-politically. America knows it is trapped, but how will it respond is still unknown. However it responds, the end result has already been decided, by the laws of mathematics. Therein lies both danger and opportunity for investors. When all else fails, rely on soothing words and mindless optimism. We live in a world where reality is very inconvenient. Particularly to certain governments and their mainstream supporters. One such country is the UK, where problems loom large, but are (currently) easily dismissed with a few comforting words from policy makers. The UK has enjoyed a mini-boom in the past few years, but only nominally of course. When the effects of inflation are removed, there has barely been any recovery since 2009. The Bank of England allowed CPI to remain well above target until 2014, as zero interest rates and £385,000,000,000 of quantitative easing helped to soothe the suffering of the country’s debtors (notably Her Majesty’s Government). This nominal boom appears to be drawing to a close already, as mortgage demand withers and house prices slide, another bubble appears to be bursting. The Bank of England, of course, enjoys perpetuating the myth that inflation targeting has been a great policy success, as well as tougher fiscal rules, but we all know (or do we?) that inflation targets have been missed, and the UK’s budget deficit has continued to expand in every year since a new government promised austerity to reduce the deficit. Is the Bank of England truly independent, or more of a poodle on a leash, with a variable length? The markets have already realised the game is up, with 10 year gilt yields falling from over 3% in 2013, to only 1.72% currently, whilst the FTSE 100 couldn’t even manage a gain in 2014, the year of peak exuberance. Big money has already left the equity markets, selling to the retail investors arriving late to the party during 2013 & 2014. Also, peak sterling looks to have come and gone, reaching around 1.72 versus the US dollar in the summer of 2014, and following a hefty decline at the start of 2015, now standing at 1.53. Trade and current account figures look dire, production too, and previous years’ GDP data has been revised lower. Business investment is contracting, although households are still spending (on imports mostly, and on credit too). All of this before the global slowdown has moved into second gear. No one can predict the future of course, but here today, we can see that policy makers are counting on soothing words, mindless optimism, and a desperate hope that you don’t believe your own eyes. It’s hard to prepare for what lies ahead, and much easier to just assume we will eventually get back to ‘normal’ and keep one’s head in the sand. That’s what the Bank of England want of course, so that when sterling does collapse, it’ll be your assets and living standards that pay the price (yet again) of bailing out the debtors. Hedging today will pay rich rewards in the years ahead we believe. Good luck, to us all. Once again the Bank for International Settlements (BIS) is highlighting the potentially devastating problems that lie ahead as this c.100 year debt bubble heads towards bursting point. Inevitably, the vast majority of those involved in the markets will remain oblivious to these warnings, and to the potentially awful outcomes for the world. Clearly therefore, the general public will also be totally in the dark as the next crisis draws nearer, and a majority of developed world economies go on to suffer purchasing power haircuts that will decimate living standards for generations to come. since end-2007 to over 110% of GDP, while private sector debt has fallen by about 10 percentage points. 40 points during the same period to over 120% of GDP, while government debt has risen only slightly. imbalances that leads to excessive credit growth. What are the three types of trouble? an impaired financial sector and a debt overhang. It is very easy for anyone to quickly dismiss pessimistic thoughts about the future effects of a debt bubble and its bursting, until those thoughts turn into reality. We suggest to our clients that trouble is looming large, and that there is the potential for the final deflationary collapse to unfold within a relatively short timescale. Hedging for this possibility is very sensible, if you know how to hedge. The vast majority of assets are currently mis-priced. We have already seen evidence that sovereign nations with full control of their own currencies (and their central banks) will do whatever is necessary to battle deflationary pressures. However, we haven’t seen anything yet when compared to what lies ahead. Their efforts will ultimately be futile, but very costly. Put very bluntly, the viability of some of the major global currencies is at risk, and with it, your expectations of future living standards. The clock is ticking, the oil and copper prices are reflecting a deepening global economic slowdown, and markets are living on borrowed time. The cycle is turning again. Are you ready for what comes next? You may have noticed that the title to this post is a quotation. A hedge fund manager we met recently told us he was always interested in hearing ‘extreme views’. We were not offended, rather we were somewhat amused. This hedge fund manager runs a medium-sized fund and has been around for a few years. We discussed how his fund had hedged and performed during the credit crunch crisis. Sadly, his investors had lost around 35% overall. Our clients gained around 15% during the crash period by the way, but only because we saw it coming and acted accordingly to move away from risk assets entirely. The hedge fund manager was very proud of his performance over the past 5 years though. He seemed unaware of the irony of regarding the recouping of losses as ‘doing well’, but that’s the investment industry for you: when it’s going up the manager will always claim to be driving that performance with superb investment choices; when it’s going down it’s ‘just the market’, and certainly never the managers fault. Many of them are mandated to be solely long-only equities, what hope do they have? So, if you’re sat on fat gains right now after a few good years, perhaps there are some extreme facts you might ponder, which we list below. Of course, we can’t give away the implications of such facts here in this post, but if you fail to grasp the significance of some or all of these facts, perhaps you will reflect back on any action you may or may not have taken in October 2014 in the years ahead. Divergences abound in risk markets. Notably small cap stocks and junk bonds in the US, as well as several major EM market indices. Yields on Bunds have been negative for several months, up to and including 2 year durations. The housing market in China continues to weaken, with sales and prices falling at a brisk pace. Commodity prices are being hammered, with oil down, copper down, silver down and lumber down in price during 2014. The dollar is rising, and the Yen is falling. The BIS, the IMF and many individual central banks are warning about the risks of market complacency built on a five-year period of zero interest rates and trillions of QE. Stocks in America are overbought, overvalued and investors, advisers and fund managers have rarely been this bullish about the future. Perhaps you are firmly in the bullish camp. It’s crystal clear to us, but trend-following investors and managers rarely do anything other than…follow the trend. Some are curious about ‘extreme views’, but unwilling to learn a few new tricks. Especially when the cheque book needs to be opened to access information they would never have even considered before: such matters as monetary evolution for example. Governor Carney has a tough job at the Bank of England, and he knows it. Recently he has been peddling forwards and backwards on interest rate increases. Does he still sound convincing? However, that’s just half the truth from Mr Carney though. The truthful part is that the Bank of England is as far away from independence as its possible to be. It is nothing but a poodle of government, and by implication a poodle of the democratic process in the UK. It’s fairly clear where the will of the voters will take the UK, and its currency too, as the gravy train is ridden to its inevitable final destination. Place your bets accordingly. The important part that is omitted by Mr Carney is of huge significance. The BIS was the driving force behind the formation and design of the Euro, the Euro-system of central banks, and the Eurozone itself. Did you know that? The BIS, rather than sitting within a vacuum, sits outside of a bubble, one that has existed for over a hundred years, and one that it will burst. How many investors in the world have spotted that the Euro is totally different from every other currency ever to have existed, including those around today? We share with our clients the background to these differences and where they will lead the world, but for readers here, please consider whether the ECB has the same mandates and accountability as the Bank of England. Consider whether the ECB’s governing council is driven by short-term political influences (voters), or whether it is operating at a higher level. Is it concerned with ‘growth’, or with the proper management of its currency? Mr Carney knows the world is changing (being driven to change, to evolve), and he will simply play his part in the UK, doing exactly as he is told. That’s democracy for you. Monetary policy driven by the masses, for the masses. Good luck in the months and years ahead, most will need it. We have copied below a brief section of a recent speech given by Jaime Caruana, General Manager of the Bank for International Settlements. His speech was titled ‘Redesigning the central bank for financial stability responsibilities’. ‘I take heart from the fact that so many parliaments have been seeking to fill the policy gaps revealed by global financial crisis, even where their countries were not directly involved. I accept that this is difficult territory. Important powers of state are involved, with important consequences for citizens’ lives should policy failures due to inaction or misdirected action occur. And I accept that dealing more effectively with financial stability concerns, and their intersection with prices stability ones, is going to be an evolutionary process. Evolution does not always progress smoothly, but rather in fits and starts. The full speech is available at the BIS website and is worth careful consideration. We see clearly that the evolution referred to above is already happening, in clear view, but virtually all are blind to its huge significance. This is a pity, but is understandable, as mankind tends not to notice major evolutionary advances in real time, they just happen gradually, and are reflected upon by historians. ‘Sweden’s Left Party, which polls show may help form a government with the opposition Social Democrats after September elections, said political consensus is growing that the central bank needs a new mandate. ‘Sjoestedt said he will also argue in favor of changes to fiscal policy to remove breaks on the economy, and will seek to scrap Sweden’s 1 percent budget surplus target. Doing so will “free up space for long-term investments that increase productivity and competitiveness,” he said. He appears to want to reduce public debt, run a balanced budget (rather than a surplus). He wants ‘strong public finances’ as he feels Sweden ‘would like a lot of welfare’. He also wants to change fiscal policy to ‘free up space for ….etc. This man is a socialist. He wants the central bank to finance deficit spending. Simple as that. He sees the Japanese doing it. He sees the Americans doing it. He sees the British doing it. He also would like some free money to dole out. There is no such thing as free money, there never is. We wish them all the very best of luck, they really are going to need it. De-evolution will eventually (and quite quickly) shoot itself in the head, and we look forward to that day. Thankfully, something better is waiting in the wings. In the meantime, our clients are aware of the evolutionary developments, all happening with some haste as we type, and we share a high level of optimism for our future as a result of what we see. Please join us, should you also be interested in a clear view.